Happy New Year: So Suzy Stamps New Release!!! I’m so excited we all made it to another year!! I guarantee you this year will be the best year. I have a lot planned for you this year!! I hope your ready for the ride because I’m ready to share with you. So let me beginning my new year with So Suzy Stamps!!! She has an awesome January release for you this month. Who doesn’t like creamy ice cream!! 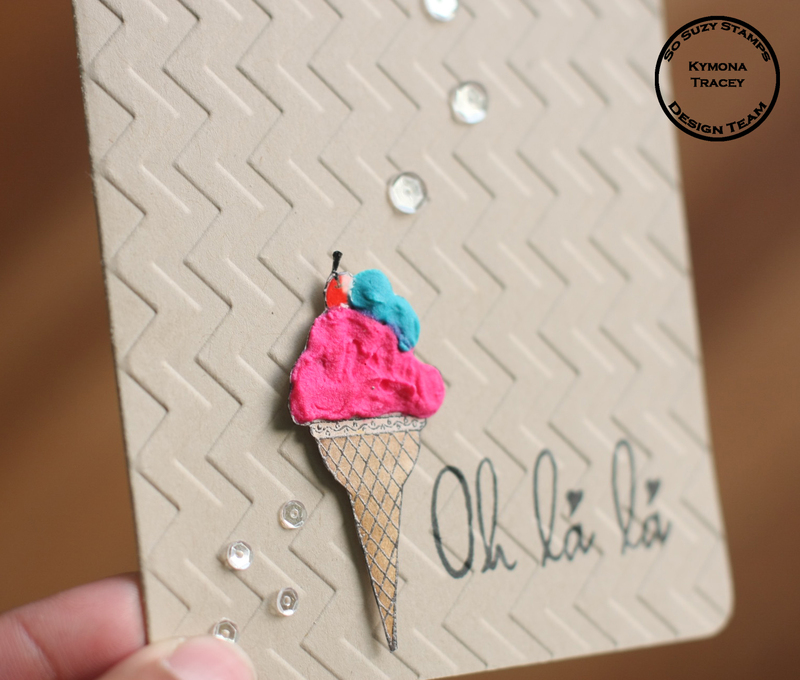 I decided to go really simple with my card because I wanted the ice cone to be the focal point of my card. Lets take a closer look at the yummyness! Don’t you just want to touch to see if its soft. Well it is! Are you wondering how I did that? I’m going to tell you. 1. I cut my Kraft cardstock to an A2 size card (4.25 x 5.50 scored at 4.25). I stamped So Suzy Stamps Oh La La stamp to the front of my cardstock. 2. I embossed the front of my cardstock with Stampin’ Up! 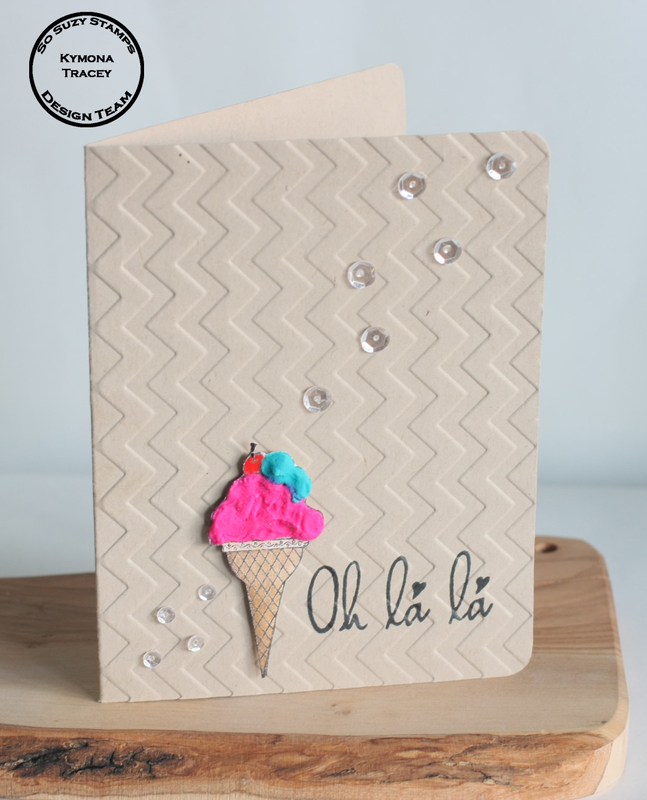 Chevron Textured Embossing Folder then set it aside to work on my ice cream cone. 3. 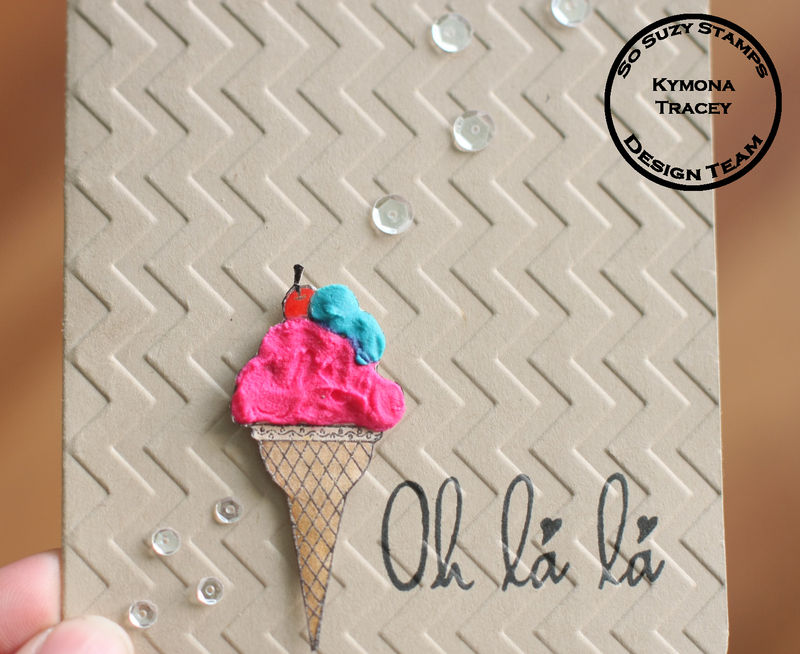 I stamped my So Suzy Stamps Ice Cone Fun Cone with Versamark ink and then embossed it with Adirondack Espresso Embossing Powder. 4. To create my textured ice, I used Wendy Vecchi Embossing Paste and Ranger Peacock Feathers and Picked Raspberry reinkers to create my delicious colors. 5. I used my palette knife to carefully add the different color paste to my ice cream area. I pushed past my embossed lines so that you don’t see my embossing. I let it sit to dry. 6. Once my paste dried, I added glossy accent to my cherry for a pop. 7. I used my Koi Watercolors to added color to my cone. The embossing gives that added texture to my cone. 8. Once the cone dried, I fuss cut the cone out and attached it to my card front using foam adhesive. 9. I added some Pretty Pink Posh 4mm and 6mm Sparkling Clear Sequins. 10. I rounded the corners using my corner chomper. Easy and fun!! My nieces and daughter loved it. I hope you do too! Now its your turn to check out So Suzy Stamps new release and a chance to play along with our new challenge! The month of January beings a lot of news. Over at the So Suzy Stamps Blog our new challenge is Ready for the New Year – Use Something New!! You have a month to linkup your new creation to the So Suzy Stamps Blog for a chance to win a $15 gift certificate to the So Suzy Stamps Online Shop!! The ice cream looks delicious, Kymona! Happy new year, dear friend. 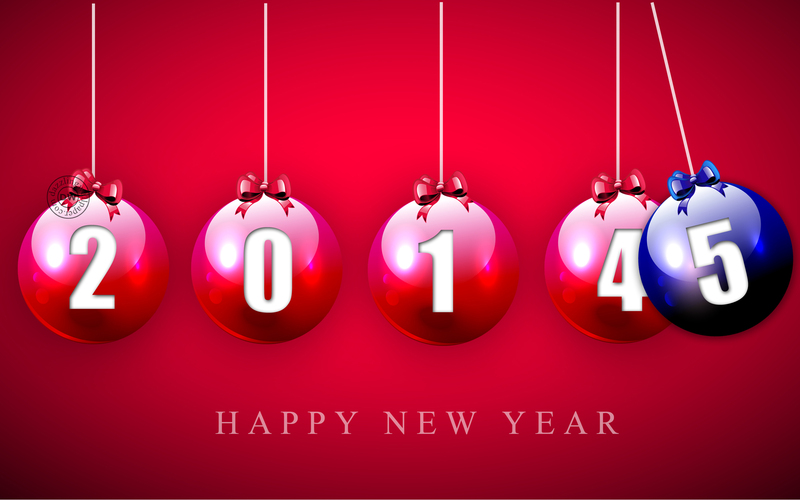 May this year bring you happiness, health, and prosperity, to you and your kids. Happy New Year! This is so neat! I love the texture on the cone. Your card is terrific! I wish you much happiness in 2015! Hey Tina!! Happy New Year to you too! Thank you so much for your wonderful comment. Yes, I’m loving that texture. I was just playing around and this is what I came up with. I can’t wait to try it again. I wish much happiness for you too in 2015!! Happy New Year!!! This is so super cute. Nice card, makes me want to sample the flavor! This card is awesome – I love how you bring so many components, products, and ideas together when you create your cards – you are a genius and I am always impressed with your work and what you have to show us!! Awesome!!!! This icecream looks good enough to eat… and it’s only 6am in the morning here lol. ps Also loved reading your ‘determined’ post, I will definitely be watching ‘this space’, I can’t wait to see what 2015 brings for you! Mmm. That looks delicious 😉 awesome card!! 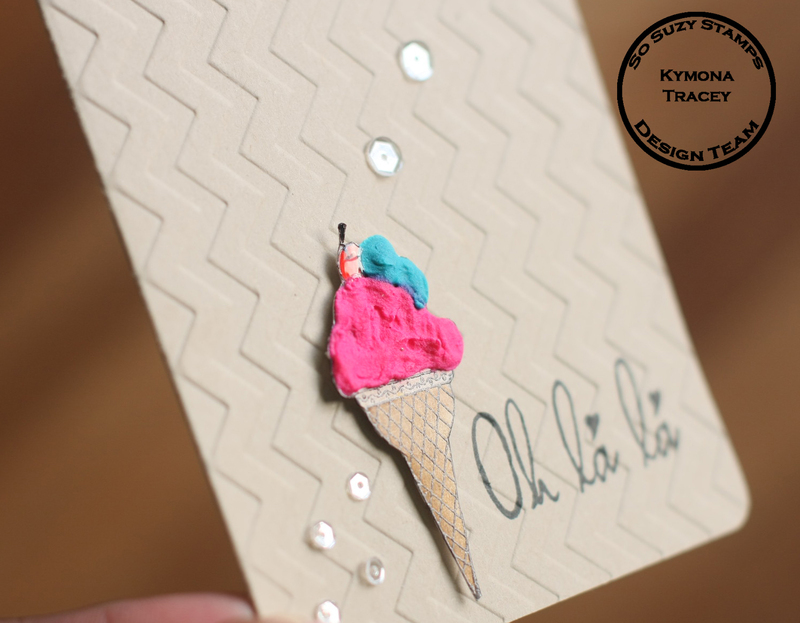 Beautiful card kymona, love the ice cream cone.. Miah put it in her faves list.